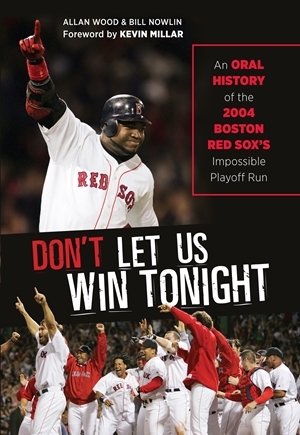 Don’t Let Us Win Tonight celebrates the 10th anniversary of the Boston Red Sox’s unprecedented championship run in October 2004 by taking fans behind the scenes and inside the dugout, bullpen, and clubhouse to reveal how it happened, as it happened. Authors Allan Wood and Bill Nowlin document how, during a span of just 76 hours, the Red Sox won four consecutive do-or-die games against their archrivals, the New York Yankees, to win the American League pennant and complete the greatest comeback in baseball history. Then the Red Sox steamrolled through the World Series, sweeping the St. Louis Cardinals in four games, capturing their first championship since 1918. Don’t Let Us Win Tonight is packed with revealing quotes from Boston’s front office personnel, coaches, medical staff, and players. Kevin Millar – who wrote the book’s foreword – talks about his infectious optimism and the team’s pregame ritual of drinking whiskey, Dave Roberts reveals how he prepared to steal the most famous base of his career, and Dr. William Morgan describes the radical surgery he performed on Curt Schilling’s right ankle. This is the unforgettable story of how the 2004 Red Sox made baseball history, in their own words.